Mark Twain once ran into a situation that paralleled an experience of his fictitious Tom Sawyer character… ie – he was reported as dead, and was in the unique position of being alive to hear it. His response was to send a note, something along the lines of “Rumors of my death have been greatly exagerrated”. “You can assure my Virginia friends that I will make an exhaustive investigation of this report that I have been lost at sea. If there is any foundation for the report, I will at once apprise the anxious public. That one gets repeated occasionally in webmaster forums. Funny thing is if you pay attention it’s almost always stated as grave fact by somebody that just happens to want to sell his own personal site promotion program… *guaranteed* to make your website run faster, jump higher, and attract supermodels. In one recent case it was stated as fact by a guy that was touting massive numbers of forum sigs as the new road to marketing a website. My thought there is that I DO notice forum sigs, and agree 100% having a site in the sig of your personal ID is ONE excellent marketing tool, *provided* it is… (A) the real thing and (B) your posts are frequent and knowledgeable, and (C) in the right forums. Nothing wrong with that. I personally generate direct traffic to sigs I think look interesting. All the above considered, the guys selling the idea of creating thousands of fake profiles (especially by bot) are ignoring the fact that any forum worth reading will regularly delete those as spam. Just as Askimet and other plugins of that genre are rapidly reducing comment spam in blogs, improved moderation software (and moderators familiar with the tactic) are rapidly making spam profiles a waste of time. Even if such links remain after the ban, there’s the dubious honor having your site promoted by a character that has “BANNED” beside his name. Doesn’t do wonders for reputation or credibility. As an added bonus, in forums I’ve moderated, once a site has been promoted by spammy methods, the mere mention of that URL tends to raise a red flag about any member that later mentions it as a valuable resource… a direct result of the previous spam attempt. Somehow I’m thinking that *can’t* have been the intended outcome when somebody paid a guy to promote the site in forums, but that’s the reality of letting your site be associated with spamtastic promo methods. Basically the “directory is dead” stuff is often tossed out by guys that wish it were so in order to get folks to put their eggs in a different basket. By a no doubt fortunate coincidence, the guys saying so are almost always in the business of selling such baskets, and will gladly provide you alternative basketry as soon as your credit card clears. When it comes to getting a website in front of people, I don’t think ANY one basket is a safe place for those future hatchlings. If somebody says their special method is a great replacement for all others, just put your hand on your wallet and back away. Even directory submissions, though a valuable tool for getting a website in front of folks, should be just ONE of many clubs in your bag. Face it, no professional (or even a talented amateur) goes golfing carrying just “their golf club”. There’s a reason. If you hear reports of my own death, please tell my wife to quit fantasizing. First BOTW promo in months… and it works in the BOTW Directory, the BOTW UK & Ireland Directory, and the BOTW Blog Directory. If you’ve been waiting for a break, here’s your chance to submit to one or all of these premium directories at a substantial discount. You may use this for multiple site submissions, submissions to multiple directory products, or any combination of multiple and submit you want. 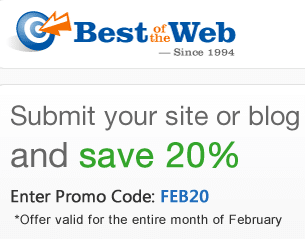 As long as it’s still February 2011 and you’re submitting to the directories named above, this discount code works. Nice eh? To submit your site for consideration, go to the appropriate category in the directory to which you’re submitting and click on the link at upper right that says “Submit Site”. Follow the prompts from there. If you need a hand picking the best category, you’ll find some tips here: Selecting a Category When Submitting. This discount program IS commisionable for BOTW resellers, so resellers, we look forward to working with you on these. That’s all the news that’s fit to print. You guys have a great week, and get those submissions in while they’re cheap. So… What have you done lately? 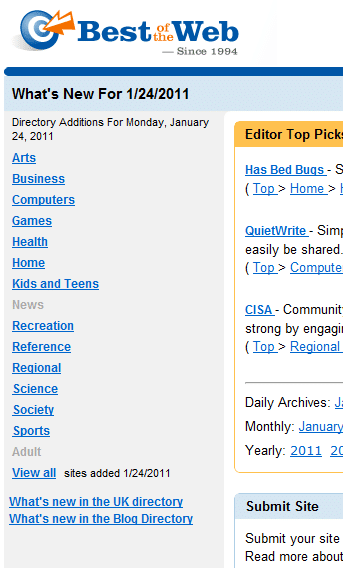 If anyone is ever curious about what kind of sites or how many get added here daily, there’s a quick way to get a look. In each of the general directories… BOTW and BOTW UK & Ireland, as well as the BOTW Blog Directory… you can get a quick look (by day and by category) at exactly what got added to the directory. Just go to the main index and click the button labeled “What’s New”. In the screenshot above, you’ll see the top level categories to the left. If a category is shown in BLUE… it means sites were added to that section that day. You can click on the category name and see the sites that were added. To the right there are archives for each day so you can see what was added on that day, and you can also click the button at bottom of page and see ALL sites added that day in THAT directory. [SAMPLE]. NOTE: If you plan on looking at all of them for any given day, bring a comfortable chair. It includes adds made by submitters to the commercial queues for each, adds submitted to the FREE queues, adds by our Volunteer Blog Editor team, and adds made by The Herd just to flesh out the directory. Just mentioning that so those that are curious what type sites or volume of sites are added here need not guess. It’s a pretty well rounded group on any given day, and which categories get hit will rotate depending on who is working which section that day. Best of the Web has enjoyed immense success with the growth of the UK & Ireland Directory in a relatively short time since it’s inception in 2008, thanks in no small part to the timely addition of a crew of editors in that same time frame who spoke the language and knew the terrain. From an editorial perspective there’s simply no substitute for boots-on-the-ground with local knowledge when dealing with a culture just similar enough to lull some folks into thinking they *might* be able to edit such a product from the opposite side of the pond. It might be done, just wouldn’t be done right. As we celebrate our second birthday for that directory I’d like to offer a huge “thank you” to the editors from that side of the pond who have poured countless hours and edits into making it possible (and to the techs that translated their vision into a reality… long as we’re giving credit where due, cause tomorrow I go back to pretending I had something to do with it). In a short timeframe the UK & Ireland crew has taken the framework of that section that originally existed in the original BOTW location and restructured it, fattened it up, and turned it into a thriving concern. Kudos to each of you. You pulled it off despite the occasional “help” the rest of us provided. I also understand that one of the other well known UK directories out there (can’t bring myself to call ‘em “competitors”… lots of elbow room in the directory world) is pulling out of the UK Directory biz, so that’s probably a windfall for us. Hard to complain about it, so instead we’ll wish them well, and share the no doubt boundless wealth to come our way with the guys that make our jobs possible, the submitters. Starting immediately and running until the last day of November, BOTW is offering 30% off on all submissions to our UK & Ireland Directory. It’s currently one of the fastest growing products in the BOTW family… so take advantage of the discount and join today. Thanks again to all concerned, and Happy Birthday! Have a piece of cake, then grab a promo code and get your UK related site into one of the fastest growing directories of its kind.